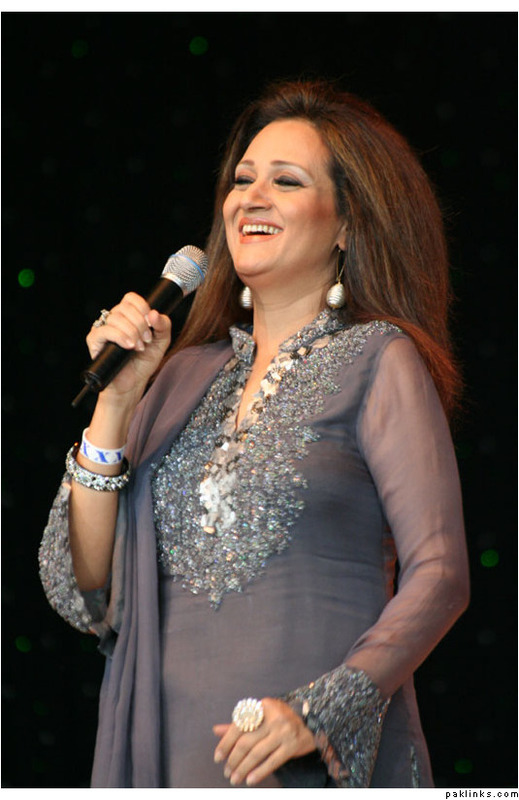 Bushra Ansari, is a Pakistani television compere, actress and producer. 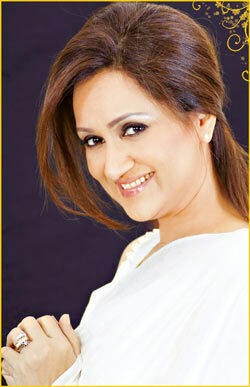 Bushra Ansari was born in Karachi. She is daughter of an eminent journalist and writer Ahmad Bashir. Bushra studied in Lahore at Lady Griffin School and then she did intermediate from famous Lahore College for Women University, completed her BA in 1977 from Waqarunnisa College in Rawalpindi. Bushra married TV producer Iqbal Ansari on June 11, 1978, who encouraged her to resume acting. Together her and Ansari have two daughters. Her younger daughter, Meera Ansari, is also an actor. She recently appeared in singer Amanat Ali's music video, Kohram. Her first appearance was in one of his productions, and since then she has appeared in many programmes, including Angan Tehra, Show Time, Fifty Fifty, Show Sha, Rang Tarang, and Emergency Ward.Bushra is a popular and versatile actress, equally at ease with comedy or serious drama. She is an excellent singer, a lively compere, and a gifted mimic. She has also worked as a model. Bushra has visited many countries and won many awards, including the Pride of Performance Award in 1989. 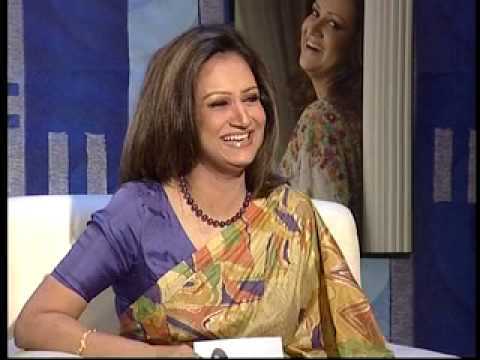 Presently Bushra Ansari host a television show Brunch with Bushra on Geo TV. The show is On Air on every Sunday. Ansari also starts in the drama Makaan on Geo TV. Just the mention of her name is enough to put a smile on your face. No matter how accomplished she may be in other forms of self expression Bushra Ansari will always be recalled to the mind as a comedian first. Probably the only female to make her mark on the funny side of local showbiz scene, Bushra has a distinct style a making the subtle of wit seem hilariously funny. From the voice on of shermeelee to the 'guy' crooning Yeh mayree zindagi hai, the female is just simply too much. At the same time she also done some real serious acting, along with dabbling in comparing and singing. In this interview with the multidimensional star, Mag4you.com attempts to explore the more personal facets of her life. Defining relativity Einstein had once said, "Sit with a pretty girl for an hour, and it seems like a minute; sit with a hot stove for a minute, and it seems like an hour that's relativity". One wonders through, why he missed intelligent along with pretty. By the way, sitting and chatting with, Bushra is the most exciting experience one can have. One simply doesn't realize how times slips by. When I called up Bushra, for an interview, she instructed me to do my homework as, she didn't wish t answer the same old questions, "I won't repeat the 'one husband, two daughters' bit every time. It' gets pretty boring." So, I did my homework, and planned upon something informal. But 'Gup Shup' with Bushra Ansari, is not the easiest of tasks. The wittiest of person feels handicapped and simply at a loss of words. On reaching the apartment, her maid led me into the living room which, being on the second floor is very airy, even without any air conditioner. With the high profile couple's award and certificates adorning the walls and cabinets, object de art scattered all over, in a more or less controlled fashion, the dcor created a very pleasant ambience, a credit to her good taste and connoisseur ship. She greeted me with a broad, smile as she entered the room, wearing a shalwar kammez, and smelling of 'Dunes' her hair pulled back neatly, she looked fresh and cool, fitting perfectly into the setting, as just another piece of art. As a conversion opener, I asked her a personal question. "What is your age?" "38" came the prompt reply. I must've heard wrong, I thought. One does not actually expect candid-sounding replies to such a question, especially from beautiful, young-appearing women. "28?" I asked to make sure I'd heard correct. "No, 38. I got married and 21 and 17 years have passed since my marriage to Iqbal." "Don't you think women need to deduct at least 10 years from their actual age?" "Yes, it is a compulsion, but may be only with film sirens. I don't hide my age and either do I have to act in Punjabi films. Their fans are their Aashiqs. I have fans who would rather admire me for my performance. Look at Babra. She looks like a girl; she has to maintain that image. I was in the tenth grade when I watched her film 'Mera Naam Hai Mohabbat' I cried for hour afterwards. I was really a simpleton", "You were simple, compared to the kids of today, even my own". Talking of kids "what kind of child were you?" "Very naughty. I used to be a typical Tomboy, climbing trees and bullying with kids, all usual boys-stuff (pause) I remember as a kid when my father was making films, I took my friends to the studio which was quite a distance away from our house. I myself was quite scared, as we had to pass through fields and forests, and there was no one in sight for miles around. I got a good spanking from my father when he came to find out about my feat." Bushra describes her youth days as splendiferous. She was the only boy in an all girl's college. "I used to wear Awami Suits and Khussas and walk with my hand held high. I always behaved like a guy." Growing up with the hip generation she was really conscious of the in's and out's of fashion. High brows block heels, straight falling hair, false lashes and bell bottoms were all essential items of her dressing. About her transformation from Bushra Bashir to Bushra Ansari she says, "It was very smooth, I was more famous than Iqbal. I was doing Kaliyaan in those days and his work was mostly behind the scenes. After the marriage, when we were on our way to Karachi, by train, I had for uncles waving at me on every station!" Unlike most wives, Bushra does not shower undue flattery on her husband. "He is OK. Decent and nice and; very disciplined. If a thing is kept in a certain way it should not be distribute. And He is a typical male chauvinist". Bushra's idea of an agreeable person is one who agrees with her, if not in the absolute then to any acceptable extent. This is something her husband appears not to do. "He is very criticizing, even on the sets he would never praise a good performance, Han, do bar toke zaroor dain gay. Nowadays, I can't even take positive criticism. Iqbal is responsible for all this. He has made me very touchy about criticism." If she does not like being criticized, then she does not criticize either unduly. On the recent row between Madam Noor Jehan and Tahira Syed she says "I was out of the country when all that happened. I think, I have no less knowledge about music than Tahira has. She shouldn't have criticized Madam Noor Jehan. Only people of Madam's stature have a right to comment on her singing, people like Ustad Fateh Ali or Mehdi Hasan". But wasn't Tahira entitled to her own opinion, about her musical performance? Didn't Madam over-react and get personal on a small issue? Isn't it right to have such an opinion I asked. You shouldn't express your opinion loudly about a person who is a legend, who has built her goodwill all her life, and whose anger is a known thing. If Tahira would have said the same thing about her own mother she would've slapped her. About her own spoofs and parodies a big names, she says "I never insulted or humiliated. I just projected them in a lively way. In fact Salma Agha's song was revived after I did its parody. Bushra does nothing to keep herself in the immaculate shape she is in, besides breathing. Much of my physical exercise is done in trying to be a good housewife. Actually it runs in my family. Nobody is obese. About the kind of mother she is, she says, I am an understanding mother who would sit and hear her daughter's problems. My elder daughter is specially attached to me, as Iqbal does not have much time. She sits on my lap, clings to me, and hugs me. Bushra is a very cooperative and helping mother. Of course in our days we never enjoyed such liberties but I've provided them freedom as it is healthy. But there are certain rules they have to abide by. Bushra is very romantic person, although she says that the definition of love and romance changes with time and maturity. Today her romance and love is her house and her family About her fame she says, people have never bothered me in the streets and the markets. They are so loving and warm. She even considers them to be her biggest asset, as she says, people shower me with so many presents and gifts that friends call me Bushra Mufti. So what is there that irritates her. She answers; Very very occasionally it happens that some people become a nuisance. They don't realize the difference between an artist and a radio set "To phir ho jai bijlee" It is really ridiculous and I feel like slapping the person. And there is this one guy who writes silly letters. He used to call me at odd hours. Then I would just say indignantly Khabees, put the phone down and get back to my work". She would rather bear all the pain herself than go and say things on someone's face if she has something against that person. "People, who know me, know that I am just like that. I just don't want them to feel insulted and embarrassed. I would rather suffer myself than let others suffer." Is she the sort of person who would not work on a Friday that happens to be the thirteenth? Her reply is "No, I am not all superstitious". She does not seem to be a books worm as I could not find very many books in her cabinet, may be they were elsewhere. She is very busy and she admits of not getting time to read books. Bushra adjusts herself to all people, in all age groups, Old Grannies, Nanis and Dadis seem to have special fondness and affection for Bushra According to her "I make old people feel homely and comfortable. They just love my company." What about some silly questions, what if you won a 2million dollar lottery, I would buy houses for all family members, marry my daughters off? May be I'd even buy an island. Ph! It's such a large amount. I'd die of ecstasy. And what if she were given three wishes. First, prosperity for my family, second, I'd spend my life with some dignity and third, that there should be peace in the city, she seems genuinely perturbed by the situation prevalent in the city. What if you are given a time machine "Oh? I'd love to go in the past and stay there. There would be no hassles; the lifestyles had been so simple. Coming back to initial statement, one never knew how time stepped by while talking to Bushra. She was expecting a few guests, and it was almost time when I would've been thrown out if I didn't leave. I thanked her and said a few nice things about her to which her reply was "Han Thandi Thandi Hawa Aa Rahi Hey. Of course she does have a lot of fans and that's why she does not need any air conditioned.